Spider infestations can be difficult to detect because spiders like to live in dark, quiet, undisturbed areas. However, once you find a spider in your house, you’re unlikely to forget it is there! Traps are commonly used for pest control. They are only effective if you place them in areas where spiders are travelling. Only the unlucky spider that walks across a trap will be caught. Since any spiders that avoid the traps will remain, traps are not usually the most effective method of pest control. 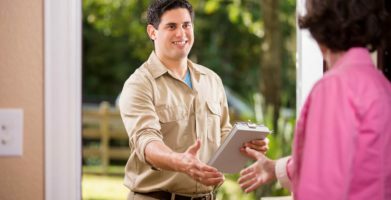 Some people may be inclined to look for chemical pesticides and insecticides to get rid of pests. These methods are rarely effective when it comes to spiders. Most foggers are not designed to get rid of spiders. Residual insecticides can be used, but these usually only work if spiders walk directly through the chemicals after they have been sprayed. If a spider manages to walk around the sprayed area, the insecticide will not affect it at all. In addition to this limitation, all insecticides and pesticides can be dangerous to humans and pets. Using natural repellents is a great way to prevent spiders from moving into your home. Once spiders have found their way into your house, they usually live in well-hidden places. Many spiders are also nocturnal, so they don’t move around much during the day, making it even harder to locate them. Most serious spider bites occur when an unnoticed venomous spider gets trapped against a person’s skin, and bites to defend itself. This can happen when putting on clothes or shoes, or any other close contact with a spider. Since it can be difficult to notice spiders, the best way to make sure you won’t run into them is by using repellents. Natural repellents are safer than poisonous chemicals, and also more effective. Stay Away® Spiders is the best method of pest control for spiders. There are no safety warnings for Stay Away® Spiders because there are no known hazards of using this product. When used as directed, Stay Away® Spiders does not present any health or safety risks to humans, animals, or the environment. You will not need to worry about small children or pets finding the Stay Away® Spiders pouches, because the ingredients are harmless to humans and animals. Stay Away® Spiders is made of botanical ingredients – citronella, lemongrass and rosemary essential oils are the active ingredients, and the remainder of the patented formulation is made of plant cellulose fiber from corn cob chips and sunflower oil as a carrier oil. The fragrance of Stay Away® Spiders is safe for humans, but offensive to spiders, causing them to avoid the area. Stay Away® Spiders comes with a 100% Satisfaction Guarantee. Following these steps to prevent spiders is safe for people, pets, and the environment, and best of all, it works! Spider infestations can be difficult to detect because spiders like to live in dark, quiet, undisturbed areas. However, once you find a spider in your house, you're unlikely to forget it is there! Some people may be inclined to look for chemical pesticides and insecticides to get rid of pests. These methods are rarely effective when it comes to spiders. Most foggers are not designed to get rid of spiders. Residual insecticides can be used, but these usually only work if spiders walk directly through the chemicals after they have been sprayed. If a spider manages to walk around the sprayed area, the insecticide will not affect it at all. In addition to this limitation, all insecticides and pesticides can be dangerous to humans and pets. Using natural repellents is a great way to prevent spiders from moving into your home. Once spiders have found their way into your house, they usually live in well-hidden places. Many spiders are also nocturnal, so they don't move around much during the day, making it even harder to locate them. 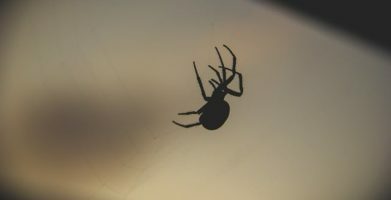 Most serious spider bites occur when an unnoticed venomous spider gets trapped against a person's skin, and bites to defend itself. This can happen when putting on clothes or shoes, or any other close contact with a spider. Since it can be difficult to notice spiders, the best way to make sure you won't run into them is by using repellents. Natural repellents are safer than poisonous chemicals, and also more effective. Stay Away® Spiders is the best method of pest control for spiders. There are no safety warnings for Stay Away® Spiders because there are no known hazards of using this product. When used as directed, Stay Away® Spiders does not present any health or safety risks to humans, animals, or the environment. You will not need to worry about small children or pets finding the Stay Away® Spiders pouches, because the ingredients are harmless to humans and animals. Stay Away® Spiders comes with a 100% Satisfaction Guarantee. 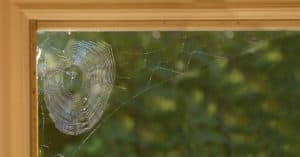 Following these steps to prevent spiders is safe for people, pets, and the environment, and best of all, it works!